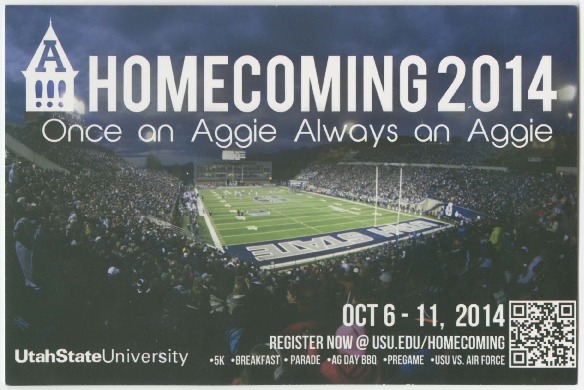 Mailer - USU homecoming 2014, "Once an Aggie, Always an Aggie." Mailer distributed by the USU Alumni Association. Contains details of the 2014 Homecoming celebration, "Once an Aggie, Always an Aggie." Utah State University Alumni Association, “Mailer - USU homecoming 2014, "Once an Aggie, Always an Aggie. ",” USU Digital Exhibits, accessed April 24, 2019, http://exhibits.usu.edu/items/show/18288.